The question any spinoff must answer first is what voice it’s going to adopt to differentiate itself from its parent show. Broadly speaking, there are two kinds of spinoffs: the brand extension and the beloved-character vehicle. The brand extension is something like Maude or Mork And Mindy or even NCIS. It’s a show put on the air because the producers of one show want more real estate on the network’s schedule and hope that by tying a one- or two-time guest character to a successful series, they’ll have an added boost with the network and viewers, who will presumably be excited to see those guest characters week after week. These types of spinoffs usually take the form of backdoor pilots, episodes aired as part of one series that feature entirely new casts of characters and only one or two from the parent series. It’s almost impossible to do a backdoor pilot well, but the brand-extension spinoff has a higher rate of success than the beloved-character vehicle. Viewers didn’t know Maude Findlay all that well, so the producers of Maude were able to shift things around to make the show work as well as it possibly could. The beloved-character vehicle is tougher because it requires a defter touch. Taking characters who are well-known as supporting players on one show and turning them into the center of their own show is fraught with danger. It can be too easy to play to those characters’ perceived strengths and make them come off overbearing. What works in a supporting role can be overdone in a lead role, and TV history is littered with cases like Joey or AfterMASH, where characters who were fun in limited amounts ended up feeling like too much when turned into the leads of their own series. The foremost beloved-character success is likely Frasier, the Cheers spinoff that took the pompous psychiatrist and moved him from a workplace setting to more of a family setting, dealing with unresolved conflicts with his father and brother. Decidedly highbrow for its era of TV comedy, Frasier made all the right choices to break with its more blue-collar parent series. Yet there was another beloved-character spinoff that almost worked. That it didn’t has to do with a great number of things, but foremost among the reasons it ultimately failed is something curious: This series fell apart because its producers—some of the best comedy producers in history—diligently kept trying to make it better. The story of Mary Tyler Moore Show spinoff Rhoda is one of a show that debuted huge and really did find ways to differentiate itself from its parent series, then found itself falling apart as its producers kept trying to mess with what had worked because it simply wasn’t as good of a show as the series could have been. There are episodes of Rhoda as good as anything on the parent show, and there are episodes that flail about wildly, looking for something to do. But at every turn, it’s evident all involved are trying to make something different both from Mary and from TV’s other sitcoms. 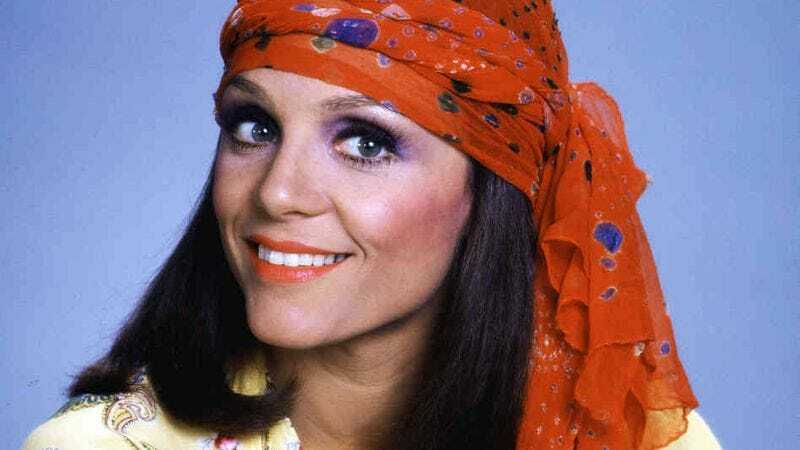 The impetus for Rhoda came from the fact that Valerie Harper, who played Mary Richards’ best friend Rhoda Morgenstern on The Mary Tyler Moore Show, had developed from the “regular girl” who was supposed to be unlucky in love and offer a contrast to Mary (who brought a smile to every face) into the sort of woman who could play the lead in her own series. When The Mary Tyler Moore Show began, Mary Richards was meant to be the homecoming queen and Rhoda Morgenstern the funny best friend, the girl next door who spent most of her time cracking self-deprecating remarks about how she’d never be married. Rhoda was also explicitly Jewish, something that drove both the character and stories about her from time to time. The comedies of the MTM Productions studio that produced Mary Tyler Moore were rarely as political as those produced by Norman Lear (of All In The Family), but Rhoda allowed for an occasional window into important issues, like the struggle against anti-Semitism. By the end of Mary’s fourth season, however, it was clear that Rhoda could carry her own show. She’d built up a backstory and a career, and she’d come to acquire a number of recurring guest characters surrounding her, including, most notably, Nancy Walker as her mother Ida. In addition, Harper’s confidence and verve in the role grew to such a degree that it started to seem ludicrous that Rhoda would be so unlucky in love. In addition, Harper, a trained stage actress, possessed a wildly different energy from Moore; she was earthy where Moore was slightly flighty. While that’s what made the scenes between the two such classics, it also suggested a series centered on Harper might have its own energy and voice. In short, a spinoff could be built around her and possibly break definitively enough with the parent series to succeed on its own terms. Rhoda Morgenstern leaves Minneapolis with two episodes to go in Mary’s fourth season. Rhoda debuted that fall on Monday nights and immediately shot into the Nielsen top 10. Rhoda was developed by David Davis and Lorenzo Music, two writers who’d filled out much of Rhoda’s backstory on Mary, and they made two key choices to differentiate Rhoda from the other “single girl in the city” comedy that had given birth to it. The first choice was to play up the series’ social-issues storytelling just a bit more. While not on the level of a Lear show, to be certain, Rhoda is very much about the range of options available to a single woman in a city like New York (where Rhoda returns at the start of the series). Ms. magazine comes up, and in one early episode, a boyfriend of Rhoda’s suggests she should move in with him, something that would have been unthinkable for Mary Richards. All of this is grounded in the gentle humanism of the MTM house style, but it’s bolder than anything that had happened on Mary or on The Bob Newhart Show. Davis and Music filled the series out with additional characters who could play to these strengths. Rhoda’s parents, Walker’s Ida and Harold Gould’s Martin, became ever more a part of her life and weren’t sure what to make of the idea of their independent daughter. Rhoda’s sister Brenda (played by Julie Kavner) was meant to be to Rhoda what Rhoda had been to Mary in the early days of the parent series. And as the voice of Carlton the drunken doorman, Music was one of TV’s all-time great unseen characters. It was Davis and Music’s other major difference that would ultimately tear the show apart. At the time, however, it must have seemed like a good idea. The boyfriend who suggests Rhoda move in with him is named Joe. Played by David Groh, he’s a construction worker, divorcé, and father who meets Rhoda while she’s on vacation in New York in the series’ first episode (titled, fittingly, “Joe”). The connection between the two is immediate, and Rhoda ultimately decides to move from Minneapolis to New York to explore what that connection might mean. Over the course of the first five episodes, the two fall in love quickly and passionately. In episode six, Joe proposes. In episode seven, Rhoda’s sister throws her a shower. And in episode eight—still one of the most-watched television episodes ever—Rhoda and Joe are married in her parents’ apartment, with most of the cast of The Mary Tyler Moore Show in attendance. “Rhoda’s Wedding” was hailed at the time as a television landmark. It won Harper an Emmy in the lead actress in a comedy category to go with the three she’d won on Mary in supporting, beating out Moore. It took away from the massive audience of Monday Night Football. It was to MTM sitcoms what a major crossover event is to comics: a chance to get a bunch of characters from different properties together to see how they bounce off of each other. By building out Rhoda, then bringing in a character from Mary to guest star occasionally, MTM was doing nothing less than creating a kind of sitcom super-universe (which it would expand the following year with another Mary spinoff centered on the character of Phyllis). “Rhoda’s Wedding” is mostly remarkable for how thoroughly the Rhoda characters are realized eight episodes in. Many spinoffs would be unable to withstand the invasion of almost the entire cast of their parent show, but watching, say, Ida and Phyllis spar is great fun, and the sequences filmed on location of Rhoda trying to make it across New York for the big event are unusually ambitious for the period. “Rhoda’s Wedding” also accomplished something that would create an immediately obvious difference from the parent sitcom: Rhoda was now married; Mary was not. The series was a hit. Even airing opposite Monday Night Football for half the season, it landed at No. 6 in the year-end Nielsen rankings, and it won Harper that Emmy. (Kavner won her own Emmy a few seasons later.) Yet “Rhoda’s Wedding” ultimately pointed to the many structural problems within the series. For one thing, Harper and Groh didn’t have tremendously good chemistry—and certainly not good enough chemistry to carry a series going forward. The world of Rhoda was also weirdly underpopulated, particularly when compared to the vibrant ensembles on other MTM sitcoms. Though the series kept trying to come up with new supporting players, it was always forced to return to the Morganstern family and Joe, an ensemble that didn’t allow for many great comedic pairings. What’s more, the writers of the show weren’t exactly equipped to turn domestic life into hilarious comedy. They’d mostly written workplace comedies, and the one great MTM marriage to that point—that between Bob and Emily Hartley—was mostly a sidebar to the real action down at Bob’s office. In short, the rest of the first season of Rhoda and its second season were rather boring, straining to tell funny stories about the title character and drifting ever more toward stories about Brenda or Rhoda’s parents. The producers knew this. Even though the show only fell to eighth in the Nielsens in its second season, the writers were fairly convinced that what would drive even more eyeballs to the show was the thing that had made Rhoda such a hit on Mary in the first place: a woman, unlucky in love, having wild adventures on the dating scene. The problem was that Joe was there, and they’d sold the relationship between them as one of the great loves of all time. Yet they decided that what was more important was to make the series better, to avoid the things that were dragging it down and making it boring. And rather than have Joe leave Rhoda off-camera or have him die in a construction accident or something, they took the unprecedented step of having the marriage dissolve on camera, in weekly 25-minute chunks that still adopted the setup-punchline form. The third season of Rhoda is one of the most fascinating sitcom seasons ever constructed, a weird combination of good ideas, solid execution, and a complete misunderstanding of what the audience wanted. Rhoda and Joe separate in the season première. They attend marriage counseling and have brutal, blistering fights that strive for a surprising amount of kitchen-sink realism. Finally, Rhoda issues Joe an ultimatum: He can really try to make their marriage work, or she’s going to start seeing other people. He tells her to see other people and exits the series, appearing in only nine episodes in the whole season. The whole sequence, with many episodes written by the great Charlotte Brown, is one of the most daring things the American sitcom had attempted to that point. (Indeed, it’s difficult to think of another show that did something similar.) It’s frequently brilliant, occasionally misguided, and always interesting to watch. And audiences hated it. See, it turns out that when you get an audience invested in a particular coupling, said audience won’t buy that the two will split up simply because the characters don’t feel it anymore, no matter how often that happens in real life. American television had never seen anything quite like the courtship and ultimate marriage of Rhoda and Joe, and viewers were attached to those happy memories of what the couple had been. Those who had sent the couple wedding gifts care of CBS soon started sending Groh hate mail for what he’d done to Rhoda, never mind the fictional nature of the situation. Television is supposed to be about stability, about people who fall in love staying in love forever. Rhoda pushed against those ideas, and it became a better show. But it also plummeted to 32nd in the Nielsens, and it never recovered. The show lasted two more seasons, stabilizing at 28th in its fourth season (which brought back Walker and Gould, both of whom had also left the series in season three to try out sitcoms of their own), thanks to a renewed focus on Rhoda and Brenda’s dating struggles. The series finally sank without a trace after just 13 episodes in its fifth season (which introduced another separation—between Ida and Martin—into the proceedings), bringing the run to 110 episodes, enough for syndication but not enough to recapture the show’s former glory. The series had attempted to reflect the changing face of marriage in the United States in the ’70s, and it had gotten punished for it. Even now, YouTube reposts of episodes fill with comments from people arguing that the show never should have split the two up, that they should have had a baby in season four. So was splitting Rhoda and Joe up the right move? In terms of the show’s financial success, no, but in terms of the show’s creative success, it was. Watching those episodes from the third season is to be reminded just how vital and wide-ranging a performer Harper was. At a time when she’s revealed she has only a few months to live, due to cancer, seeing her at her best explains the huge outpouring of grief that surrounded her announcement. And watching “Rhoda’s Wedding” followed by an episode like “The Ultimatum” is to see just how the producers created a better show but chased away an audience that wanted to be comforted, not confronted. In “Rhoda’s Wedding,” Mary Richards arrives from Minnesota and eventually comes to see Joe as the perfect man for her best friend. In “The Ultimatum,” Rhoda calls to tell Mary the marriage is on the skids, and Mary tries to offer her signature “it will be okay” sincerity. It would have worked on The Mary Tyler Moore Show, but it plays as hollow in the confines of Rhoda, no matter how much Rhoda might say it made her feel better. Not every marriage gets a happy ending, even on TV. And while that might have been truer than ever in the 1970s, the TV audience was increasingly embracing uncomplicated, dumbed-down programs, shows like Charlie’s Angels or Laverne And Shirley. Americans have rarely turned to television to be reminded of the darker and sadder parts of life—even when those parts are accompanied by a laugh track. The producers of Rhoda forgot that at their own peril.